Hammer 1 rolled into the Barbican last night determined to continue the drive to consolidate their Division 3 status. In the way were Hackney 3, also caught up in their own relegation struggle. This was a true six-point game, to quote the football parlance. On paper Hammer 1 had the strength in depth and a healthy advantage grading-wise. However, matters are never that simple; holding all the aces still means you have to convert them. In short, Hammer 1 came through this contest in fine style with a 6.5-3.5 win. We are now on 3.5 match points and almost on the verge of safety and thus retaining our place in Division 3 of the LL! In reverse running order, boards 10 and 9, Orial and Matteo respectively, secured solid wins without ever being in any real danger. Hammer were on their way. Boards 8, 7 and 6 saw Josue, Safi and Sheikh all take draws to keep the points ticking over. Again, the draws were all pragmatic and in light of the way the match was moving, entirely sensible. This was a night where the match result was everything. Boards 5, 4 and 3 saw myself and our new member Marios, plus Jeremy, step up. Well, to be entirely honest Jeremy and Marios did – I on the other hand, was away with the fairies! 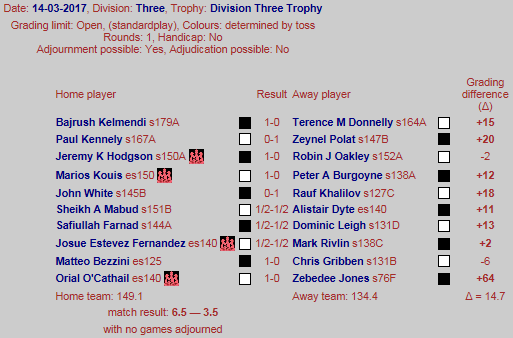 Marios won in fine style against a Benko gambit and coaxed the error from his opponent, whilst Jeremy also took advantage of a blunder to secure his win. He felt he was lucky – my own view was that he was due some fortune after some of his mishaps earlier this season. Remember, the mantra is a win is a win! Plus their two wins secured the match. As for myself, I contrived to play a totally wrong move order in a Sicilian Najdorf – fought back, achieved equality, relaxed and then blundered. I think my chess brain is frazzled at the moment, and skiing can not come soon enough. Our boards 2 and 1 saw the reliable due of Paul and Bajrush in play. Bajrush finished his game first and was the epitome of the WOSF and a man in a hurry. Whilst Paul, fatigued from his exertions the previous evening where he triumphed in an adjourned game from a Thames Valley match vs Richmond, played his worst game of the season. Just one of those nights. Josue is now sporting a white-bleach-blonde set of hair which is dramatic to say the least! He foolishly made a bet that Barcelona would not come back against PSG with a friend. Guess what happened, and guess what the forfeit was? Sheikh agreed a draw in the adjourned game against his Surbiton A opponent without hostilities being resumed. This spared us the humiliation of an 8-0 whitewash and all in, team Hammer owe him a huge debt of gratitude! We bow before thee, Sheikh!! The match was played at a rapid rate and we were all out of Golden Lane, including Hammer 5, who were also on duty, well before 10pm. Is this the fastest time ever for clearing Golden Lane with all games completed? I firmly believe that with the addition of one or two players, such as Pavel and AN Other next season, we will be strong challengers for promotion. Part One of the master plan is nearly complete with the goal of Division 3 retention all but achieved. However, rest assured, there will be no let up from me for the final three matches. A top-half finish is achievable. Finally, as captain of this excellent bunch of soldiers, my thanks. Previous Previous post: Royal Bloodshed!